This month's theme for the City Daily Photo community is out of focus. For me having something out of focus needs to have a purpose. 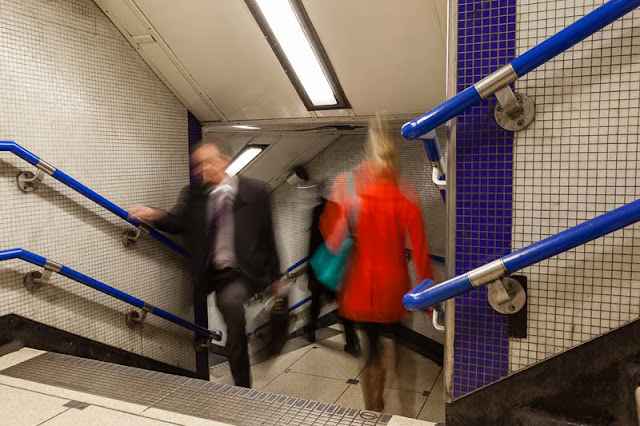 In my contribution to the theme day, I have used a slower shutter speed to make the people blurry to give a sense of how frenetic and busy London's underground can be. The stairwell remains sharp so it is obvious the movement is deliberate and not a mistake. See how others have interpreted the brief here. A neat way of creating a shot for the theme. Good way to capture the sense of movement! Now this is a recently familiar scene to me! ;-) I like it! I like your interpretation as you need to demonstrate that the choice to be out of focus is deliberate and not just a mess up. Could have been the front of a beautiful book! I like this effect - you are very talented! You can really see the movement. Very nice. Nice. I was wondering what you would do. Your images are always nice and crisp, so having an intentionally blurred shot must have given you heartburn. Love it! There is a 'Hopperesque' element to it as well. Frenetic, movement, and isolation. Perhaps it's the lady in red.